I was first elected to Suffolk County Council in 2006 and my very first role was on the Adult and Community Services Scrutiny Committee, which I went on to become its Chairman. My first executive role came when I was promoted to Assistant Portfolio Holder – Resource Management & Transformation, where I learnt about the finance and funding arrangements of the Council. In addition I held various other roles such as Vice-Chairman of the Roads and Transport Scrutiny member of the Audit Committee and the Constitution working party. After 18 months as a Councillor, I had the honour of being elected Chairman of the Conservative Group, a role essentially about representing the voice of the backbenchers in a strong cabinet system. After the county elections in 2009 when the good people of Row Heath were kind enough to re-elect me, I was promoted to the position of Portfolio Holder for Adult and Community Services, the largest and perhaps the most complex of the portfolio structure. Last year, in a reshuffle my role was expanded to take in political responsibility for Public Health as the team moved across from the NHS to the County Council; in this capacity I chaired the selection panel for the New Director of Public Health in Suffolk. More recently I shared a platform with Duncan Shelbie CE of Public Health England at its eastern regional conference, speaking about the role of Councillors in the context of Public Health and the Health and Wellbeing Strategy for Suffolk. A part of the newly defined role is that I had the political responsibility for Suffolk’s role in the London 2012 Olympic games, its legacy and sport across Suffolk, spearheading two campaigns Suffolk the Most Active County and Volunteering Suffolk. Since the 2010 Comprehensive Spending Review and the series of cuts to the funding of Local Government announced at that time, I have politically lead my department reorganisation and reduction in officers from 3,500 to about 1,000 with a number of former staff teams and business units mutualising and forming their own social enterprises, contracting back service provision at a lower cost to the council. I have also forged strong working relationships with the voluntary sector as I championed the Council’s work in commissioning voluntary providers to provide services on behalf of the Council with a strong focus on outcomes and on forming strategic partnerships. In these two areas I have spoken at a number of national conferences and am a strong advocate of this approach to providing services and cutting costs. Recently I lead the team that spent two years working on the transfer to the private sector of the Council’s remaining 16 Care Homes and the introduction of £60Million’s worth of private investment into new Care Homes, in this capacity I had the pleasure to visit all 16 of the council run Care Homes on a number of occasions explaining the process, listening to concerns and going back to explain our decisions with customers, their families, carers and our staff. In 2011 I was elected Chairman of the East of England Local Government Association (EELGA) Lead member group for Adult Social Care, this group has gone from strength to strength and holds regular packed meetings sharing best practice from across the region helping each other with information shared learning and coming to a collective view on a number of issues. In this role as Chairman, in 2012 I became a founding Vice-Chairman of EUREGHA (European Regional and Local Health Authorities) a pan European on Health and Social Care. In 2011 I was also elected to Forest Heath District Council and have played an active part in the council reorganisation, changing to a Cabinet system, creating a shared joint back office with St. Edmundsbury Borough Council, which has allowed the two councils to reduce staff numbers by almost 50% and thus delivery savings that have allowed Forest Heath to continue to deliver 0% Council Tax rises. I also used my experience as a Councillor to chair its Performance and Audit Committee, I am now the Deputy Chairman. As the new Government has instigated reforms of the NHS, I has been instrumental in the construction of the Suffolk Health and Wellbeing Board sitting on the national Collaborative Learning set work undertaken by the NHS Confederation. I have also worked with officers and Suffolk’s Implementation Executive team establishing Suffolk’s Healthwatch and defining its relationship with the council’s Health Scrutiny; I’ve also undertaken worked with the Kings Fund on the Health and Wellbeing Board self-assessment tools. After the elections in May 2013 I was asked to be the Cabinet Member for Finance and Property on Suffolk County Council, looking at the total costs issues rather than just one department’s. I have also championed the setting up of the EELGA Lead Member for Finance network and was elected its first Chairman. In May 2014 I was dismissed from the SCC Cabinet having launched and failed in a Leadership challenge to the Leader of the Council for his failure to address mine and many of my fellow Conservative member’s concerns on finance and other issues. In May 2015 I was elected to be Group leader thus Leader of the Council, which was a great honour, that came to an end in May 2018 when the group elected a new Group Leader and I stood down as Leader of the Council. 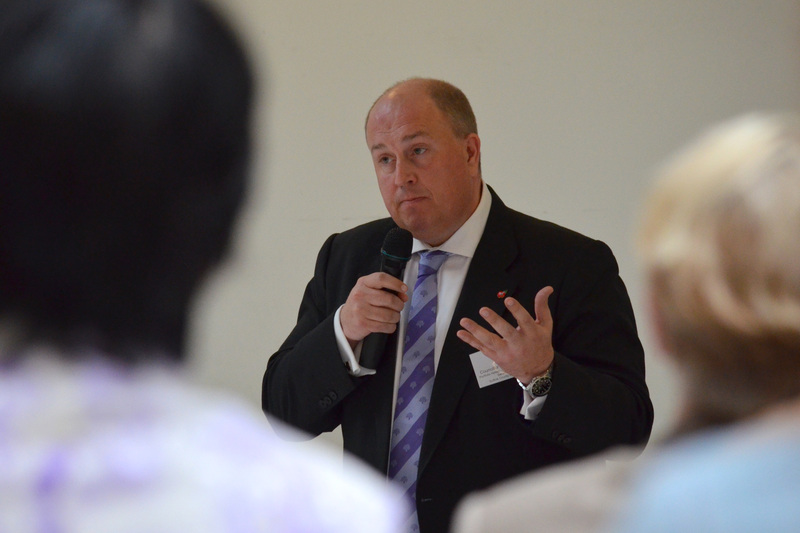 I am a strong advocate of community groups and played my part in the establishment of Suffolk’s Supporting Lives, Connecting Communities strategy and in 2013 hosted and spoke at the launch of the Suffolk Older Person’s Council Charter reaffirming the County Council’s and my personal commitment. I am an active representative for Suffolk on the Local Government Association and prior to that as a representative on the County Councils Network, I am now on the CCN Executive Committee and am the organisation’s spokesperson for Health and Social Care Integration. I was a substitute member and then full member of the LGA’s Community Wellbeing Board for 4 years and in these various roles I am regularly asked to attending meeting with Ministers of State to discuss Social Care and finance issues. In 2012 I gave evidence to the House of Commons Select Committee on life as a Councillor. In 2013 I had the honour to be elected to the LGA Conservative Executive. A role I held for three years before being elected as the County Council representative on the same body in 2016 and in2018 I was elected again this time as an ‘At Large’ member. I take training and learning about the roles I hold, very seriously and amongst various on-going training courses I am a graduate of the Leadership Centre for Local Government’s 1st year Next Generation programme and have completed the IDeA Leadership Academy and the Social Care and Health Programmes. A part of being a Councillor is to Champion the businesses in our great county and from May 2015 to May 2018 was an active Board member of the New Anglia Local Enterprise Partnership and worked closely with them and the Suffolk Chamber of Commerce to help businesses grow and expand here in Suffolk. I sat a founding member of the Cambridge to Norwich Technology Corridor Initiative. I also came up with the Suffolk A14 Gateway Strategy and started the process of producing a collaborative Suffolk 2050 vision. Alongside my role as a Councillor, I have held a number of political positions – I was an Norfolk and Suffolk Conservatives Area officer for three years before becoming its Chairman and as such a member of the Eastern Regional Team, I am now the Regional Deputy Chairman Political. I am the past Deputy Chairman Political, then Chairman , Vice President and finally President of the West Suffolk Conservative Association, a period of some 13 years. From 2011 to May 2013 I also spent two years as acting Chairman of Norwich North Association, home to Chloe Smith, Member of Parliament and former Minister in the Cabinet Office. I work extensively with Norfolk and Suffolk Conservative political groups and individual members on the improvement agenda and the politician’s role. I have also acted as occasional campaign organiser in a number of local elections, unpaid of course! In 2013 I was accredited as a Member Peer with the Local Government Association and amongst other activity was asked to appear before it’s Rural Commission to present some of the challenges as I see them in providing Care services in rural counties. I have been involved in two Adult Safeguarding Peer Reviews and others around Social Media. I also worked with the Association of Directors of Adult Social Services and Public Health England about working in a political environment. From July 2016 until May 2018 I was the County Council Network Spokesperson on Health and Social Care. In July 2016 I was appointed the LGA Conservative Eastern Regional Peer and help share the experience of Councils and Councillors across the Eastern region. I am also an active peer and get involved in Corporate Peer Challenges and am one of the Conservative lead members on a programme for Public Health England, the NHS and Local Government officers about working in the political environments. In 2018 I switched from Local Government Association Conservative Regional Peer back to the Community Wellbeing Board. In 2019 I was elected to the Conservative Councillors Association Board as the ‘County Council Representative’. Away from politics I run a busy business in the Construction Industry focussed on housing delivery, specialising in Modern Methods of Construction. I have been a past Fellow of the Institute of Direct and Digital Marketing. I love watching and supporting Football, occasionally play golf and live with my Partner of 21 years, Lisa, in a cottage we are renovating.